Need an extra body in your haunted house? A male companion in the car on a dark creepy night? 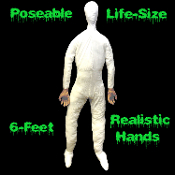 6-foot tall Halloween Haunted House Full-Size Adult Male Display Mannequin, with Soft Pliable Cloth Body and realistic lifelike flesh-tone rubbery plastic Hands. Soft Halloween Costume Prop Accessory with pliable cloth body, stuffed head and polyurethane hands. Comes completely stuffed! Dress him up for Christmas and holiday parties with a Santa or Elf suit, or dress him up as your favorite Grandpa Bob sitting in his favorite easy chair!!! Flexible- You can dress and pose any ghoulish way you like! *Dummy is lightly stuffed to save on high shipping costs. Opening in back allows you to add more stuffing, or recycle using old plastic grocery bags, which are free-of-charge, readily available, light in weight, and pack into all the nooks and crannies for a firmer dummy!!! Opening in back allows you to adjust stuffing or add your own wire support, such as a coat hanger, not included. **Must be supported to maintain a pose, either by leaning on furniture or another prop, table etc, or by adding wire or other supports to maintain a chosen pose.!!! Full life size - 6-feet (72-inches) Tall. Need an extra body in your haunted house? Or the look of a man keeping company beside you in the car on a dark creepy night? Create your own inexpensive spooky props for Halloween, or any character display for every holiday or season of the year, with this squooshy soft MANNEQUIN. Makes a terrific low cost retail boutique model or portable craft show exhibit! ***If you want it to stand, you would need to attach it to something, or insert wires, or pvc tubes, dowels or pipes. *See our MANNEQUIN HEAD FORM FACE COVER - MALE or FEMALE - Headform face covers that fit either of our styro-foam mannequin wig heads. They're already made up with a man or woman's dummy face for an easier way towards a more realistic look. They cover the front of the head and velcro around the neck. Just add a wig, hat or hood to complete the look! Made in life like vaccu-formed molded plastic, they fit over our standard styro head form wig stand display. Will fit the male and female standard form. Tip: After your event simply roll up and box while still dressed, and store for easy set-up each year. We've used anything from packing peanuts, newspapers, or old plastic grocery bags! Question: Is this Dummy weatherproof? Answer: I would imagine you would have to attach it to a pole with inserted heavy-duty wire or insert pvc pipe or hardwood dowels for stiffness & stability. This is a soft stuffed figure, like a stuffed animal. I have used the stand and pole from old standing torchiere-style lamps I got from garage sales and thrift shops, as they already have tall poles attached to a weighted base. But because it's soft-stuffed, you'd either have to add alot more stuffing to make it super-firm, or insert some type of supports in the body, legs and arms to withstand the extreme weight you are talking about.